In this page you can find articles to tweak ASSP and to reach better usage of ASSP Deluxe for cPanel . If you would add an article please send an email here with your credits (your business url and full name). Use these tweaks at your risk . Please open your ASSP WHM interface and click "ASSP Deluxe for cPanel checklist" . Apply the checklist. With ASSP 1.9.x you will find some new powerful features some enabled some disabled by default which you can enable using ASSP Web Interface depending on your needs. -- There are no more preloaded "relaxed/moderated/aggressive" spam settings in your ASSP WHM > SCORE settings. also to set custom settings lever per email . If you want change default scoring menu you can use the scoring settings menu in ASSP web interface . Now all the spam scores used by "ASSP Scoring" menu are listed in ASSP web interface > scoring settings. Scoring settings are automatically set when you enable or disable ASSP scoring mode, or when you upgrade your ASSP using your ASSP WHM . The values can be customized using the ASSP web interface > scoring setting menu. 554 5.7.1 Mail (SESSIONID) appears to be unsolicited - REASON - resend with the code NOTSPAMTAG appended to subject and ask to have your email whitelisted (the code NOTSPAMTAG changes each 24 hours). Something changed in the way you STOP and START ASSP , plus other news. -- New Configuration Sharing menu . It allows you share between your ASSP assp.cfg between your servers . What is local and remote ? local email: an email sent FROM your server from a local email . All email which have a domain listed in /etc/localdomains are considered local . -- ASSP Web interface > SMTP session limits > Max Size of Local Message Adresses (MaxSizeAdr) . Now you can set individual maxSize values (email size limit in bytes) for local email addresses, domains, user names and IP addresses . -- ASSP web interface > SMTP session limits > Max Size of External Message Adresses (MaxSizeExternalAdr) . Now you can set individual max Size values (email size limit in bytes) for remote/external email addresses, domains, user names and IP addresses . 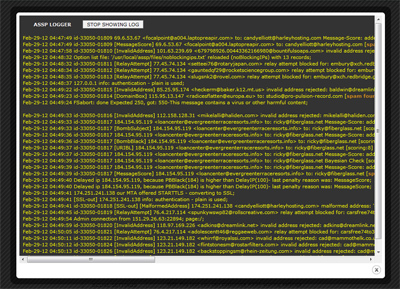 -- ASSP Web interface > SMTP session limits > Max Real Size of Local Message Adresses* (MaxRealSizeAdr) . Now you can set individual MaxRealSizeAdr values (email size limit in bytes per number of recipients) for local email addresses, domains, user names and IP addresses . -- ASSP web interface > SMTP session limits > Max Real Size of External Message Adresses* (MaxRealSizeExternalAdr) . Now you can set individual Max real sizes (email size limit in bytes per number of recipients) for remote/external email addresses, domains, user names and IP addresses . -- New scoring settings menu in ASSP web interface . Now all the spam scores used by "ASSP Scoring" menu are listed in ASSP web interface > scoring settings. Scoring settings are automatically set when you enable or disable ASSP scoring mode, or when you upgrade your ASSP using your ASSP WHM . The values can be customized using the ASSP web interface > scoring setting menu. in SPAM ANALYZER and OKMAIL ANALYZER thanks to new [GOOD ?] and [SPAM ?] TAGS. - cPanel frontend 7.0 for your end users greatly improved , also the HELP section is now more clear and complete . - find_abusers.php has been improved , now executes faster and collections of bad ip is more sure . This is the new recommended find_abusers.php cronjob, if you upgraded to ASSP 1.9 updated it as possible. 500 These attachments are not allowed -- Compress before mailing. You can change these settings using your ASSP Web Interface as required ( attachment menu ). By default all rejected messages will go on spambox. If you set a ccMaxScore 70 (i.e.) all email rejected with a score >= 70 will not go on user spambox. he receives an email with a list of all the email rejected last 5 days (data extracted from current maillog.txt) . The client can also click the email to resend the email . added on the ASSP noprocessing list . The email info@clientdomain.com will bypass all antispam checks . If you have ASSP WHM 6.x and ASSP 1.9 DO NOT follow the SSL stunnel below, please use the ASSP WHM INTERFACE > SSL MENU to setup your ASSP SSL . Be sure your all your ASSP alternative ports (listenPort2) are allowed on your firewall (TCP IN/OUT). Using below "how to" you can use SMTP SSL/TLS to send email securely using port 465. All lines starting with # are commands to execute as root. If you get something like "stunnel 4.05 on i686-redhat-linux-gnu PTHREAD+LIBWRAP with OpenSSL 0.9.7a Feb 19 2003" you can continue. 2. You can make your own certificate for SSL or use cPanel cert. This howto shows how to use cPpanel cert. To make your own cert just search google for instruction and change cert path in stunnel.conf to your cert. 6. Setup 127.0.0.2 - if you don't do this you will create open relay on SSL port. 7. Now bring lo:1 up. If you make a mistake here you can make your mail server open relay so double check the settings. 8. Open TCP IN/OUT port 465 on your firewall. Everything is ok and ready to use. you should see your server SSL certificate. You can use Unofficial clamD signatures along with ASSP and existents clamd official signatures to greatly improve SPAM and virus detection. ps aux | grep -m1 "clamd"
Click Perl Modules , and if your have "File::Scan::ClamAV 1.8 installed and available" your clamd is working fine. Finally be sure you have ASSP Deluxe 4.3.0 or above and ASSP WHM 4.4.0 or above . Note: by default email verified as bad by unofficial clamd signatures are SCORED (using vsValencePB by default set to 36) as soon the unofficial signature is verified . Unofficial signatures will be updated each day at 05:00 AM (the script contains internal checks to avoid more frequent updates since if you try updating signatures more often your server ip can be easly banned) . The script before starting waits a random amount of time (1m-30m) to make sure everyone using this script doesn't go and download the definitions at the top of the hour. When all your signatures will be loaded for the first time (it could require also 1 hour to upload all your signatures , due to antiabuse sleeping time) , ASSP spam detection could/will improve greatly . Note: by default email verified as bad by unofficial clamd signatures are SCORED (using vsValencePB by default set to 42) as soon the unofficial signature is verified . The usage of unofficial and all official clamd signatures listed below require about 150 MB RAM .If you do not have enough RAM you may experience clamd failures ; in this case you should remove the cron signatures.php or exclude some signature as explained below . Using the code below you can exclude some signatures also to safe some RAM in your system. The usage of all signatures need about 150 MB RAM. If you have ASSP deluxe 5.1.4 or above signatures.php will detect VPS and will load automatically only low memory signatures. If you would report a bug/idea/suggestion/feedback related with Unofficial clamd signatures please send an email clicking here.